Plan for a small group getaway with family and friends at Traveler’s Rest in Pigeon Forge. Less than 3 miles from downtown, this pet-friendly cabin features 3 bedrooms, 3 bathrooms, a full-size kitchen, and a second kitchenette. 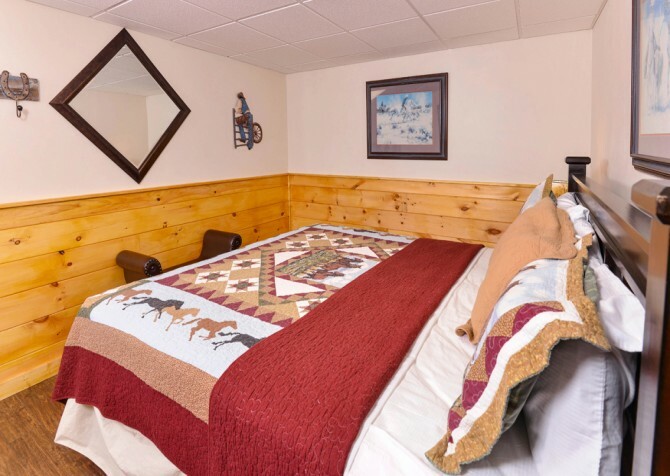 You’ll have comfortable accommodations for up to 8 guests at Traveler’s Rest and plenty of ways to keep your group entertained. 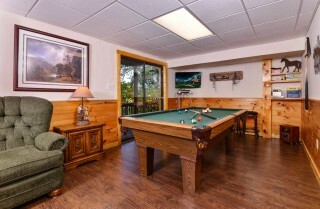 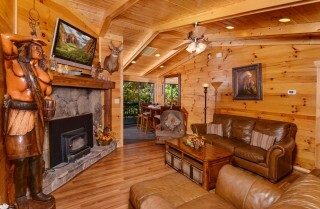 The large rec room inside this cabin features a big screen TV and full-size pool table. 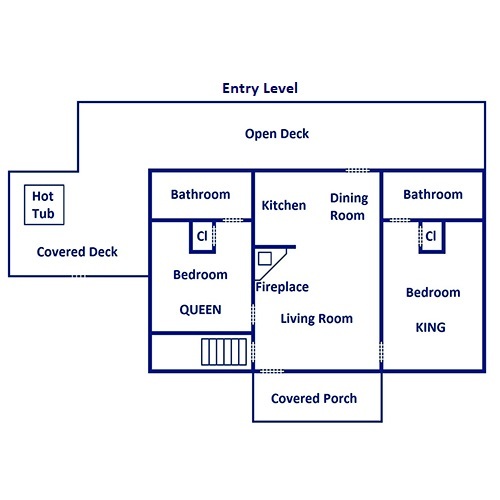 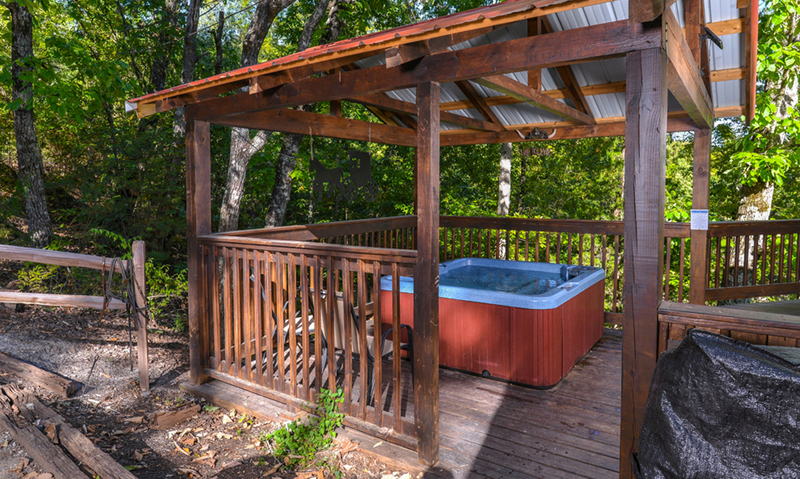 The multiple deck levels feature an outdoor hot tub, rocking chairs, and a porch swing. From here, enjoy distant views of the Smoky Mountains surrounded by old-growth trees. 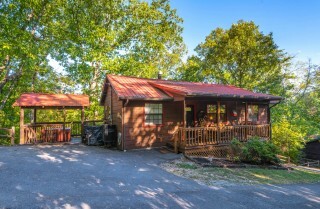 The semi-private lot of Traveler’s Rest provides the quiet atmosphere you’re looking for in a Pigeon Forge cabin without sacrificing convenient access to downtown attractions. 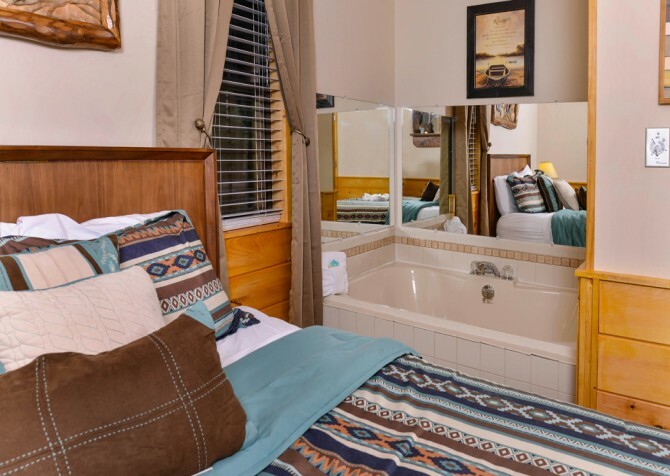 So before you book your getaway with friends, girls’ weekend, bachelor or bachelorette party, or family vacation, check out Traveler’s Rest. You’ll have plenty of space, plenty of amenities, and a beautiful cabin where you can spend time with all your guests—4-legged friends, too! 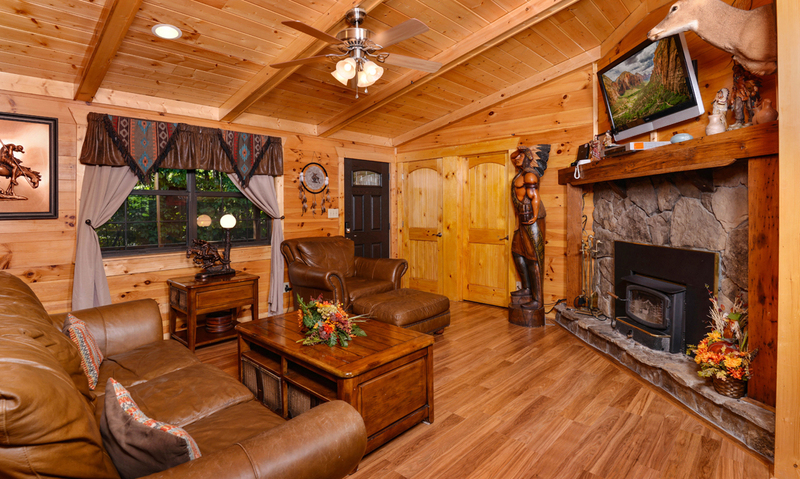 A large, cozy living room with Southwestern-style décor awaits you inside Traveler’s Rest. This room offers vaulted ceilings and plenty of floor space for a spacious place to relax after shopping in nearby Pigeon Forge or trying out a popular Smoky Mountain activity like whitewater rafting with your crew. 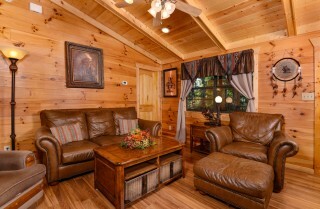 Inside the living room, you’ll find a full-size leather sofa and matching chair with ottoman. There’s also a coordinating chair that’s oversized and perfect for sinking into after a long day of walking in the Smoky Mountain woods. Feel free to sit back and unwind with your favorite show on the big screen TV or with a crackling fire in the wood-burning fireplace surrounded by beautiful stonework. 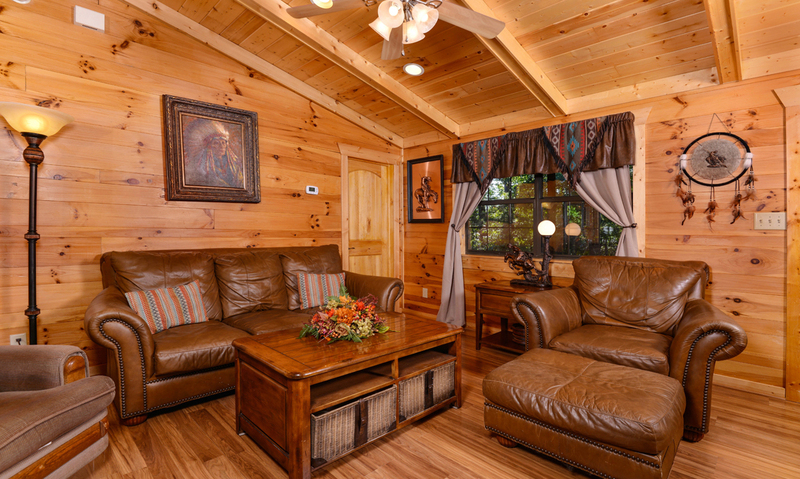 The large coffee table and matching end table can be used to store refreshing glasses of sweet iced tea or a delicious array of snacks. 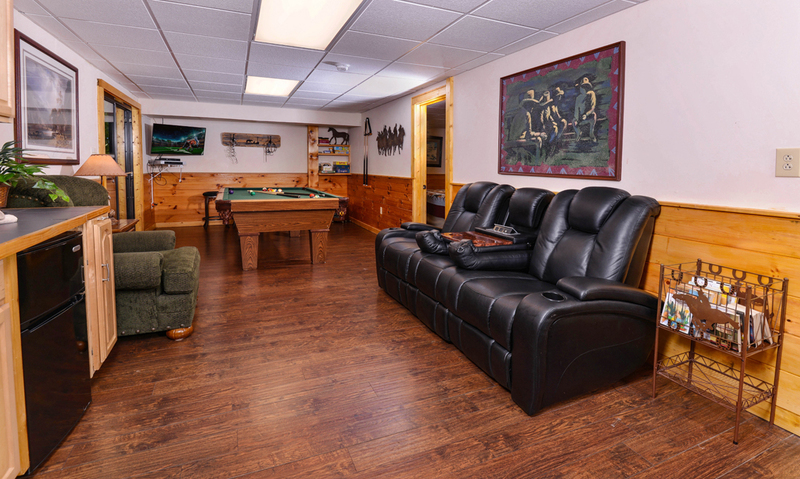 Of course, you can also use the coffee table for board games and cards—a perfect way to pass a rainy day with friends or your kids. The first thing you’ll notice about the Traveler’s Rest kitchen is its modern appeal and design. The tile backsplash with hues of gray and the coordinating granite countertops provide a clean, updated look inside your Smoky Mountain cabin. 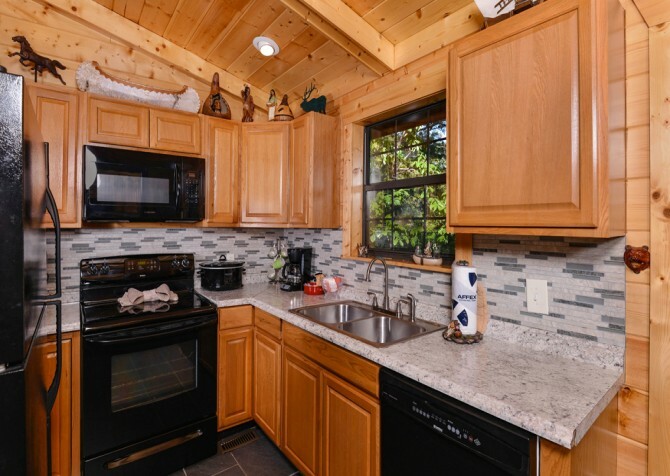 All of your major appliances come in black, and you’ll have access to small appliances like a coffeemaker, double toaster, and tea kettle as well. 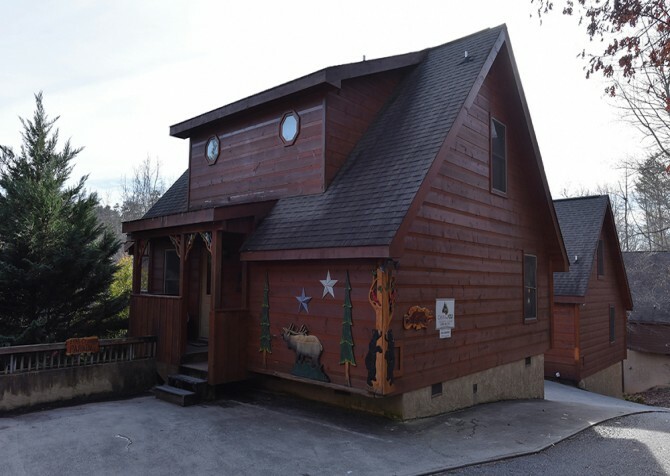 Feel free to use the kitchen for storing and reheating leftovers after a delicious dinner in downtown Pigeon Forge. 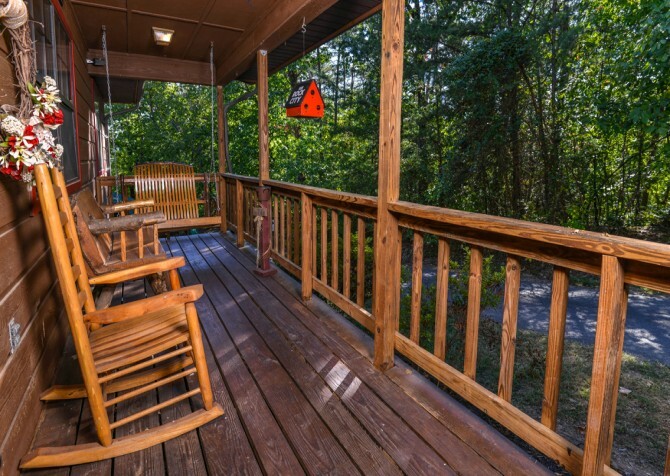 In fact, Traveler’s Rest is less than 3 miles from downtown, so popular restaurants like Bullfish Grill and Calhoun’s will be easy to find. But if you want to save a little money, you can stop by the local farmers market or a nearby grocery store and cook in the cabin instead. Traveler’s Rest provides you with plenty of options to make your Pigeon Forge stay comfortable and convenient. 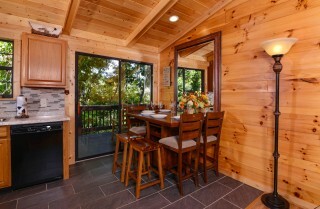 The cozy dining table found inside this cabin is located just beside the kitchen. 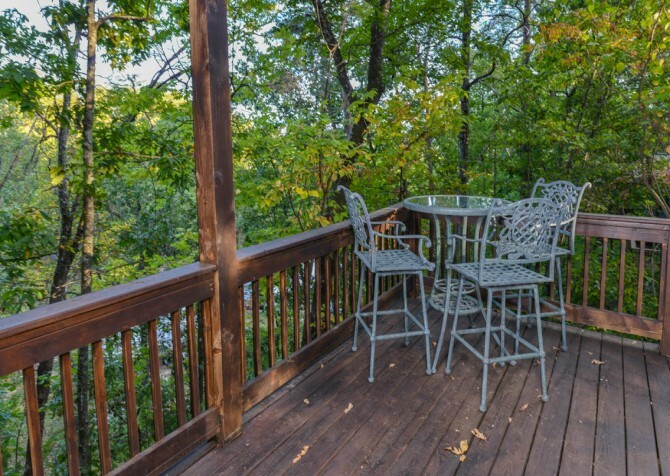 You’ll find a pub-style table with place settings for 4. But don’t worry if 4 chairs isn’t enough for all your guests—the living room is nearby for those who don’t mind eating in comfort on the large leather couch. 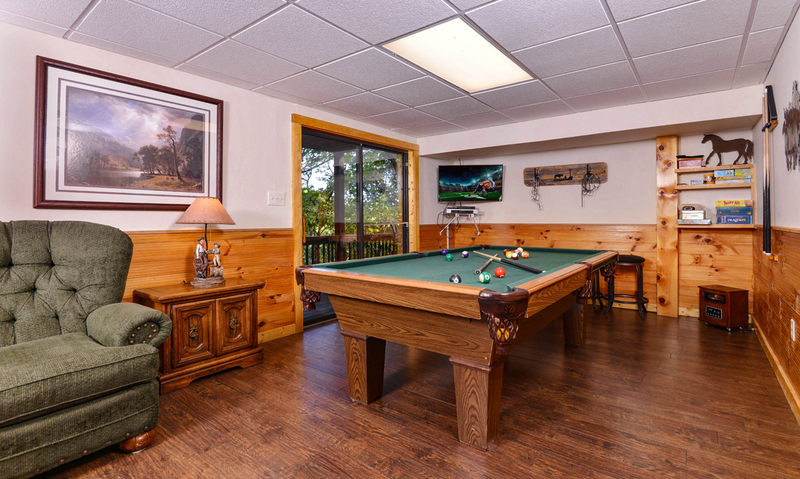 There’s also a second dining table in the rec room with space for 4 guests and plenty of room at the picnic table on the deck for those looking to enjoy a quiet meal outdoors. 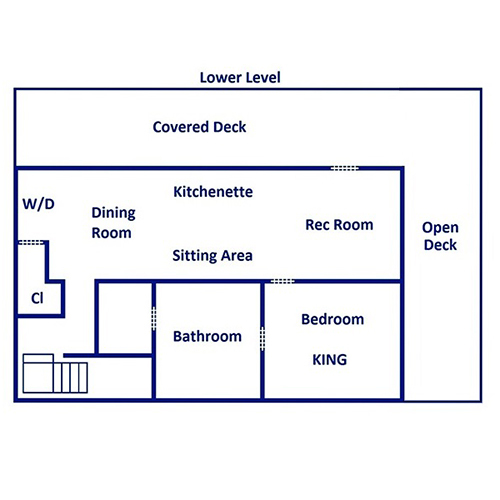 When mealtime is over, transform the dining table into a card table or the perfect spot for board games. Take advantage of the natural light that fills this space while spending quality time with the ones you love. 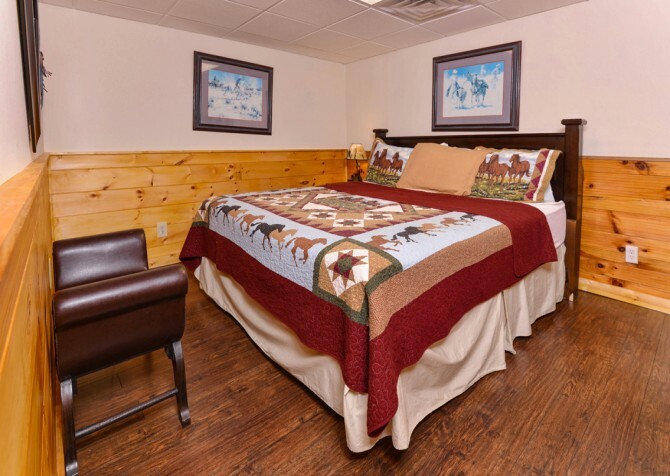 If you’re looking for a cozy space where you can get away during your stay at Traveler’s Rest, the rec room is just the place. 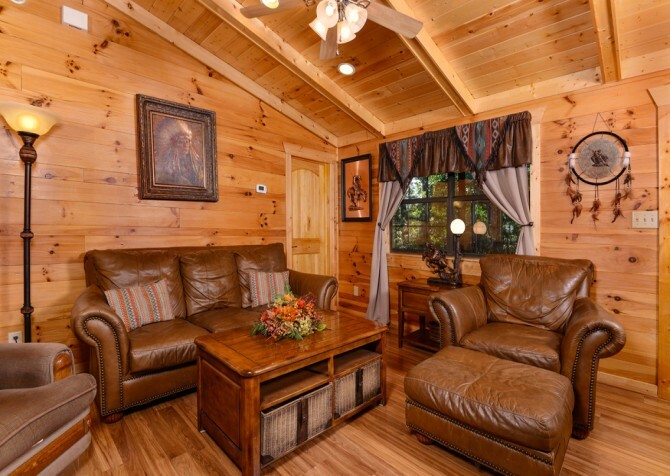 This large room features a comfortable black couch with built-in cup holders and armrests as well as an oversized green chair. You can relax with a good book or hang out between shots while playing a game on the full-size pool table found in this space. 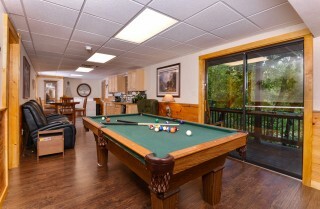 Or you can try your hand at the new foosball table! 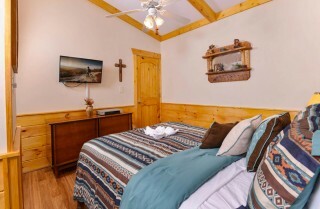 Mounted in the corner of this room is another flatscreen TV. 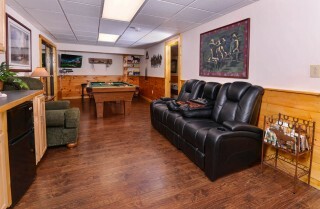 This is a great option for guys who want to keep it on sports or kids who don’t want to miss their favorite cartoon. You can play pool and watch your favorite show at the same time inside Traveler’s Rest! As an added bonus, this room also features a kitchenette. 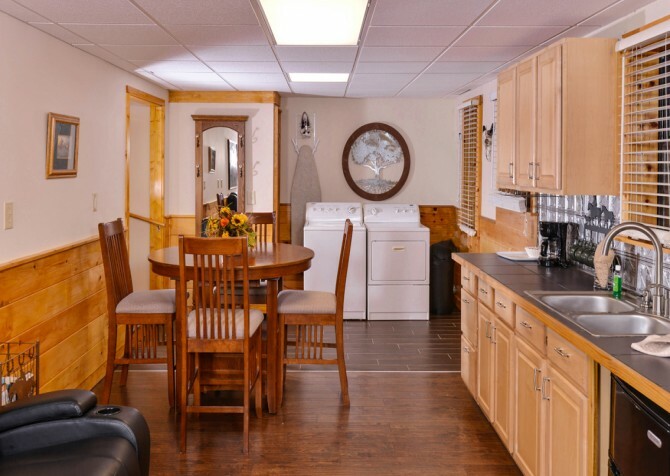 With a full sink, mini fridge, additional coffeemaker, and plenty of counter/cabinet space, this kitchenette is sure to come in handy during your Smoky Mountain stay! 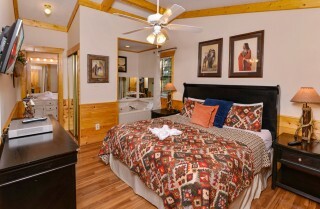 The Southwestern-style décor and comfortable accommodations continue in the bedrooms of Traveler’s Rest. 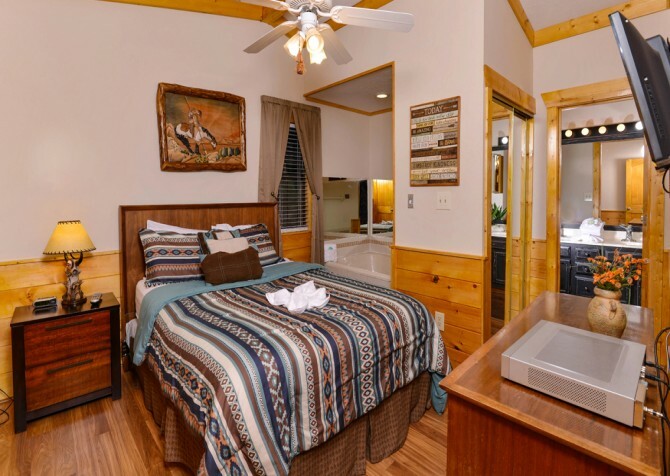 Inside this 3-bedroom cabin, you’ll find 2 king-size beds, 1 queen-size bed, and 1 queen sleeper, providing you with sleeping space for up to 8 guests. 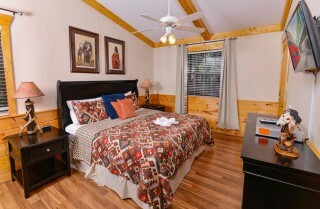 You’ll be happy to know that each bedroom comes with its own TV—which means no fighting for the remote before bedtime! 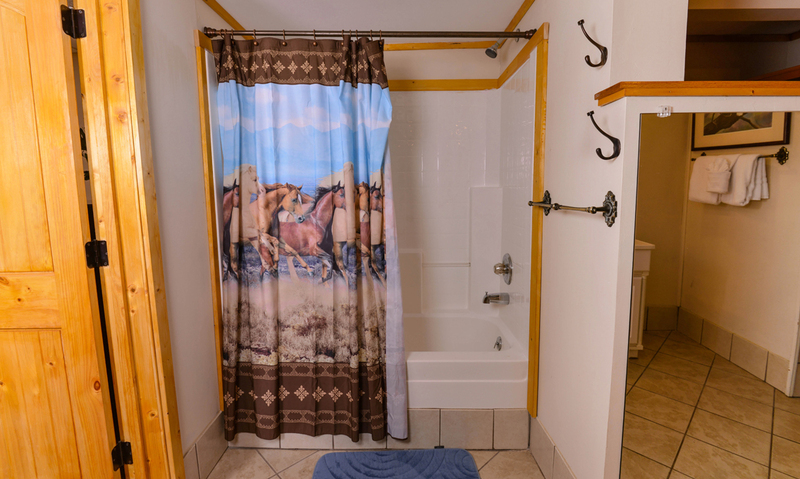 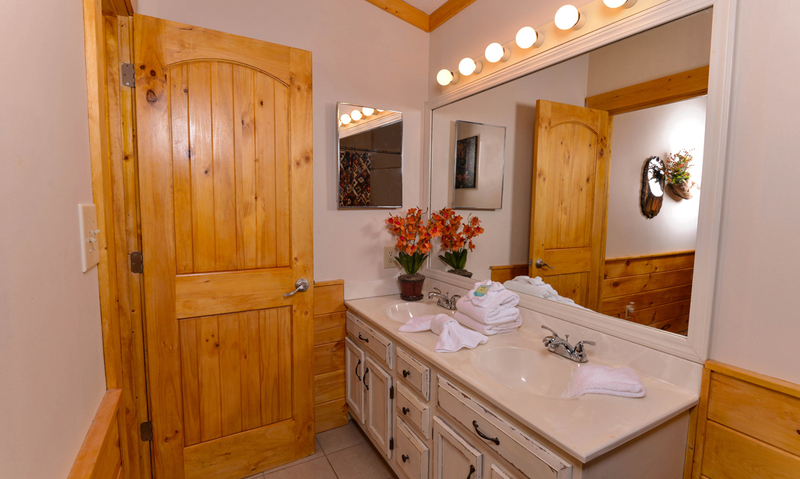 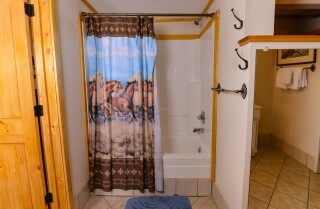 Along with the 3 bedrooms, Traveler’s Rest offers 3 full-size bathrooms and, as a bonus, 2 indoor jetted tubs. 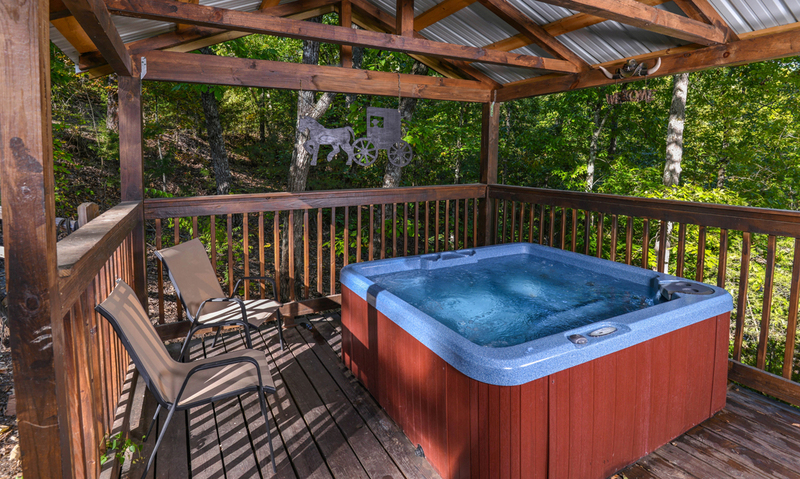 Use these to soak away stress or relieve sore muscles after hiking in the Great Smoky Mountains National Park. 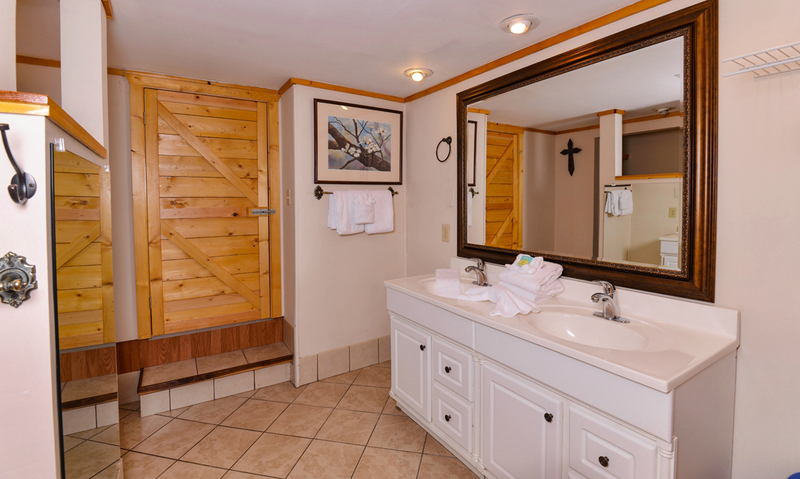 Your jetted tub is also a great excuse for some much-needed alone time during your Pigeon Forge stay! The multiple levels of decks, from which you can enjoy tree-studded views of the Smokies, provide plenty of ways to soak in these amazing sights. 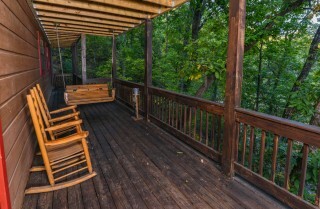 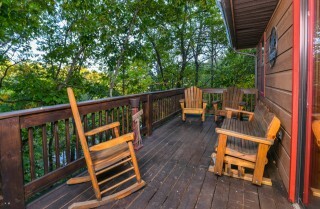 You can relax on the wooden porch swing or one of several rocking chairs. You can soak in your private outdoor hot tub. You can rock with your grandkids on the front porch. 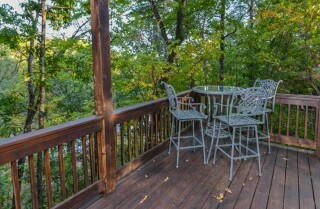 Or you can enjoy a family picnic on your very own wooden picnic table in the back. 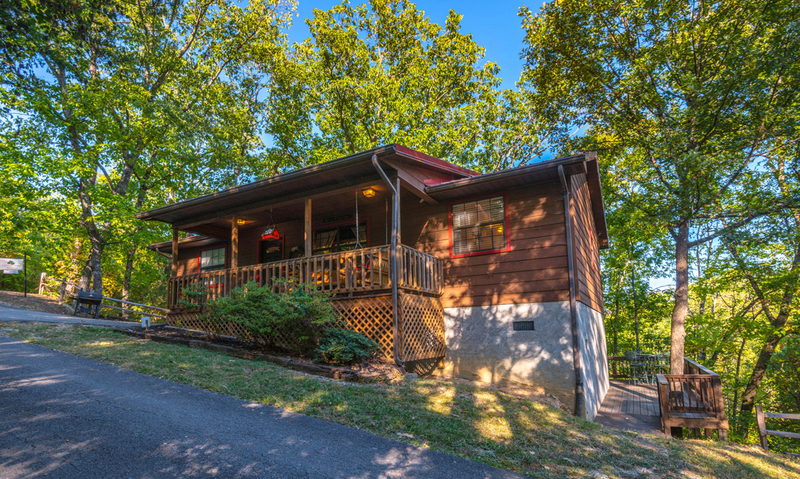 The semi-private lot of Traveler’s Rest provides you with the privacy you’re looking for, and amenities like a charcoal grill make this Pigeon Forge cabin your home away from home in the Smokies. 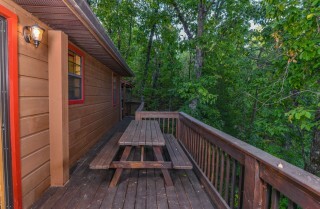 Traveler’s Rest is a great cabin for families or a small group of friends. You’ll find everything you need to stay comfortable and entertained while in the Smokies. 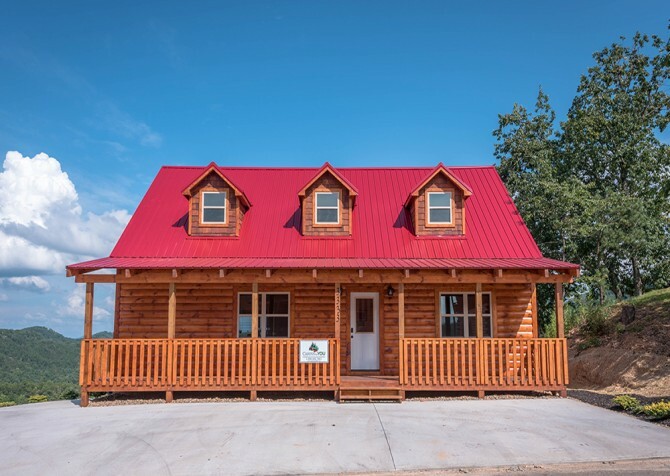 What’s even better, this cabin provides convenient amenities like high-speed wireless internet and a washer/dryer, so you won’t miss out on the facilities you’re used to while you’re away from home. And don’t forget that this cabin is pet friendly! 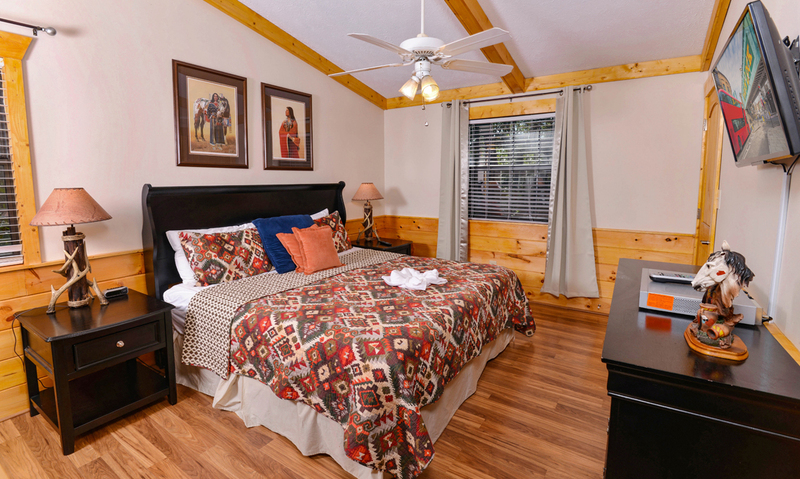 You can bring the whole family to Pigeon Forge this year when you book your stay at Traveler’s Rest. 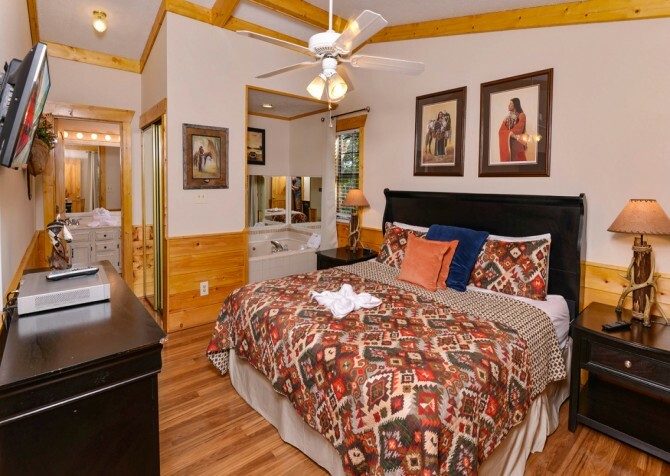 Just miles from Traveler’s Rest is one of the most popular family-friendly attractions in the Southeast. This all-inclusive theme park features rides, shows, good food, and more! 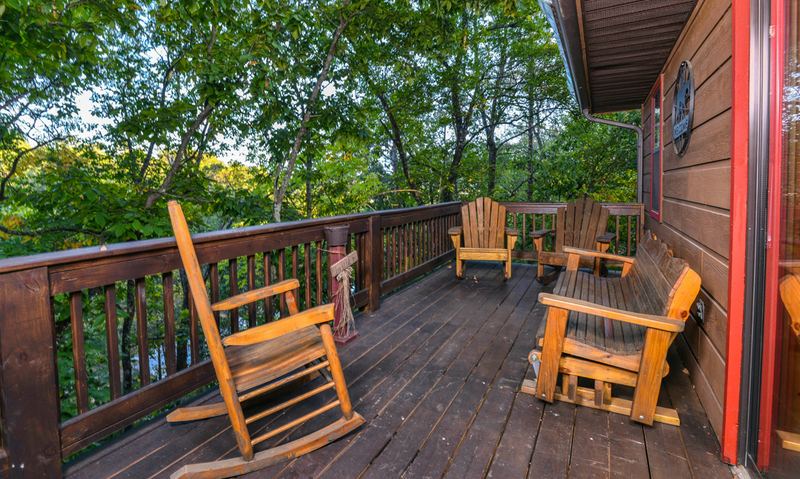 If you’re looking for a place where you can stop, shop, and chow down all in the same location, just head to the Old Mill in Pigeon Forge. 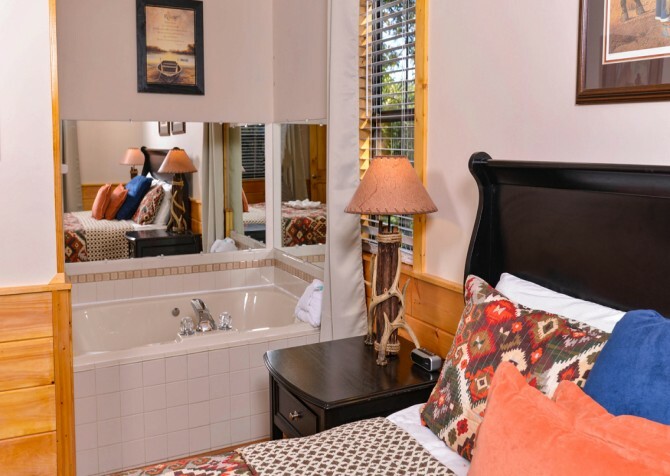 Good country cooking, hand-crafted pottery, and a variety of other goodies await you at the square. 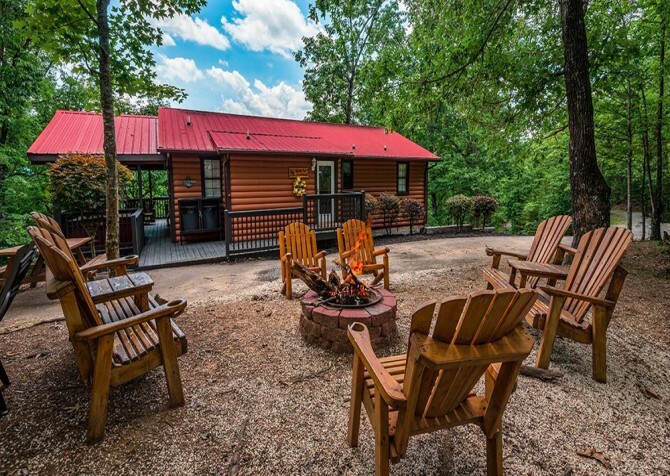 Boasting some of the fastest go karts in the Smokies, this kid-friendly attraction offers a tall wooden track and twisting roadways for a go-kart experience unlike any other! 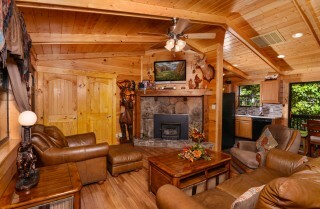 "Awesome cabin and great customer service! 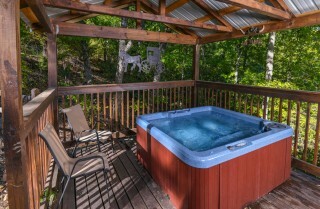 Definitely recommend!" 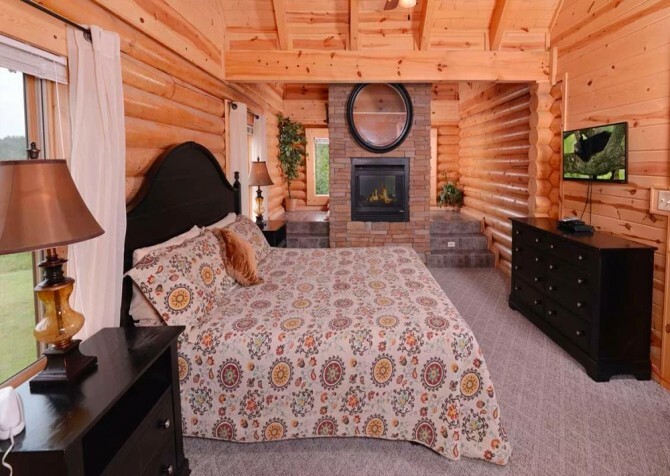 "We stayed in Travelers Rest in Pigeon Forge, and loved the accommodations, and access to the attractions! 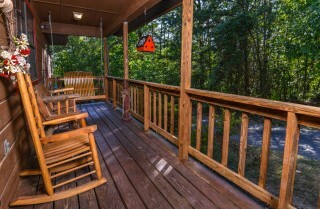 We will go again!"